LED double face black exit with energy efficient LED lighting technology. A low cost, yet durable exit for any commercial building. The sturdy construction along with its clean lines means it will look great for many years to come with very little maintenance. It's also suitable for areas like industrial, hospitality, schools and universities for those on a tighter budget. 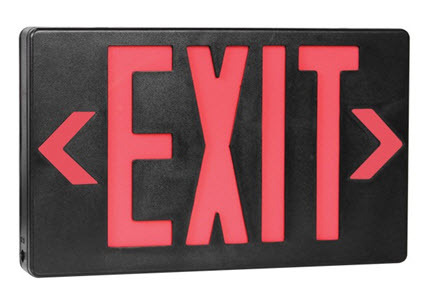 This LED exit can give you the exit strategy you desire for almost any building that you may have. Slim profile thermoplastic LED exit offers long lamp life, energy efficiency and uniform illumination in an economical package. - Long life, energy-saving LED lamps. - Battery backup time 90 minutes. - Universal double face (extra faceplate included). - Maintenance-free sealed nickel-cadmium battery (battery backup versions).